Of the 49 countries in Europe, Christianity decreased in 33 countries as a percentage of population by at least 1 point from 1970 to 2015. This is according to data from the World Christian Database. 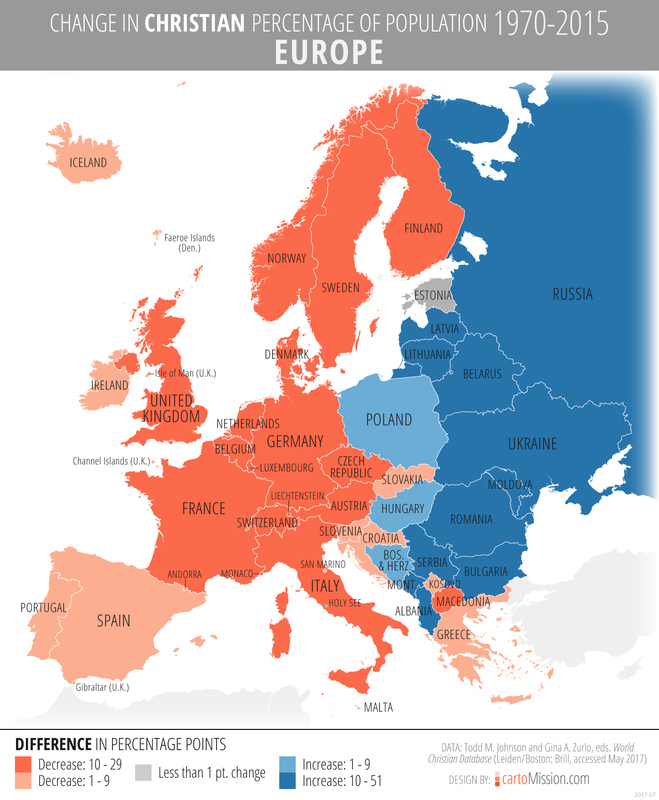 The decrease in Christian percentage occurred in all of the nine countries of Western Europe, 10 of the 13 countries of Northern Europe, 12 of the 17 countries of Southern Europe, and two of the 10 countries of Eastern Europe. The largest decreases were found in the Netherlands, Czech Republic, Belgium, Austria, and Germany. Christianity as a percentage of population increased by at least one point in 14 countries. Eight of these countries were in Eastern Europe, four in Southern Europe, and two in Northern Europe. The largest increases were found in Moldova, Russia, Latvia, Albania, and Montenegro.